Four young men surrendered Thursday to face charges alleging a fraternity hazing ritual caused the alcohol death of a university freshman from Texas, police said. Carson Starkey, 18, of Austin, was found dead in December with a blood-alcohol level between 0.39 percent and 0.44 percent. Police said he had to drink a bag full of alcoholic beverages as part of the fraternity pledging process. "This investigation has exposed a ritual that was as disturbing as it was deadly," Police Chief Deborah Linden said. "Carson's death was the result of a crime and it was entirely preventable." Haithem Ibrahim, 20, of Lafayette, and Zacary Ellis, 22, of San Luis Obispo were charged with felony hazing causing death. Russell Taylor, 22, of Fresno, and Adam Marszal, 21, of Carmichael were charged with misdemeanor hazing. All four California Polytechnic State University students face a misdemeanor charge of permitting a minor to consume alcohol. Starkey was pledging the Sigma Alpha Epsilon fraternity, which has since been suspended. According to fraternity tradition, the pledges participated in "Brown Bag Night," in which a "Big Brother" purchased alcohol and put it in a brown bag for each pledge to consume, police said. Ibrahim was Starkey's "Big Brother," but because he was not yet 21, Taylor allegedly purchased the alcohol on his behalf. Police said Marszal, Taylor and Ibrahim went to two stores to buy liquor, including 151-proof Everclear. On the night of Dec. 1, the pledges gathered in a garage that fraternity members had prepared with tarps on the furniture and a bucket for vomit, police said. The 17 pledges sat in a circle around the bucket and Ellis allegedly instructed them to drink all the alcohol in their bags by midnight. The "Big Brothers" watched while the pledges drank. The investigation found that when Starkey passed out, several members put him in a car to take him to a hospital - removing his pledge pin so he wouldn't be associated with the fraternity - but he then began vomiting so they took him back to the house and put him to bed. Police said the members checked on him until everyone went to bed about 2 a.m. When he was found unresponsive the next morning, fraternity members allegedly shooed other pledges out of the house before police and paramedics arrived. "Dangerous hazing rituals remain part of the culture of certain groups - a culture that claims to promote leadership and value friendship, but which fails to protect young and impressionable recruits who simply want to belong," Linden said. Above: Haithem Ibrahim, 20 (left), and 22-year-old Zacary Ellis (2nd, left) face felony charges for the hazing death of an 18-year-old fraternity pledge. Russell Taylor, 22 (3rd from left) and 21-year-old Adam Marszal (far right) face misdemeanor charges. Although the incident occurred off-campus, university president Warren J. Baker issued a statement Thursday reiterating the school's zero-tolerance policy for hazing. Starkey's parents said in a statement they believed their son would not have wanted to join a fraternity if he knew the initiation rituals were dangerous. 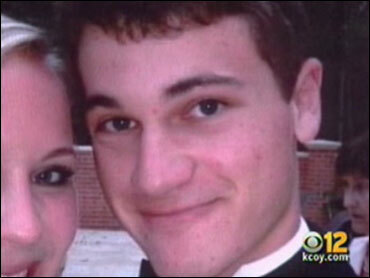 "He participated in a dangerous fraternity ritual during which he was compelled to drink a fatal amount of alcohol. His death was not caused by 'voluntarily' drinking too much, and anyone who might suggest otherwise is misinformed," they said. "Vomiting is a sign or symptom of alcohol poisoning, and we don't know but if they had realized that and took him to the hospital as opposed to, 'Oh, good, he's throwing up, he's going to be okay,' maybe Carson would be alive today," Texas State Senator Kirk Watson (D) told CBS Station KEYE. Watson, whose son grew up with Starkey, has authored a bill that would require educating Texas public school students about the dangers, symptoms and causes of alcohol poisoning and binge drinking. Watson told KEYE correspondent Katherine Stolp that the bill is not only about honoring Starkey's life but about making a difference and hopefully changing others' habits. The bill already passed the State Senate; Watson expects it to pass through the House on Friday. Ibrahim and Ellis were released on $50,000 bail and face up to three years in state prison if convicted of the felonies. Taylor and Marszal were released on $10,000 bail and face up to a year in county jail if convicted of the misdemeanors. Attempts to contact their attorneys on Thursday afternoon were not successful. To watch a video report from CBS Station KEYE on the arrests in Carson Starkey's death click on the video player below.